Important public meeting on Wednesday, November 9th at 7 p.m. in Springfield. All parties with an interest in the future plans for passenger and freight rail service in our region are encouraged to attend this meeting and offer their comments and input to the State Rail Plan Update. This is the only planned public meeting in Western Mass. before the updated plan is finalized, and the next update to the rail plan will likely not occur before 2021. 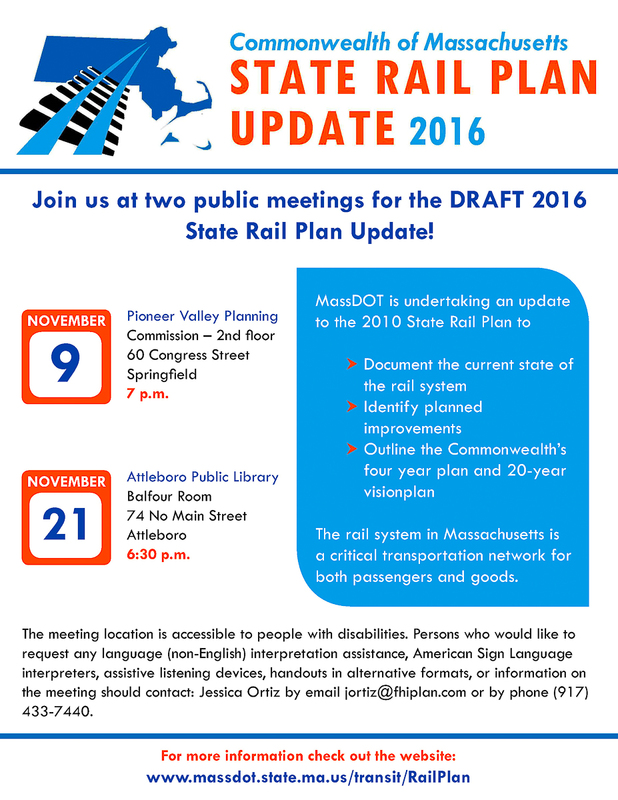 The Draft 2016 State Rail Plan Update has not been yet been posted on MassDOT’s website. As soon as this document becomes available we will share a link to it. Note also that we expect that there will be an opportunity for written comment to be submitted as part of the outreach effort. As soon as these details are available they will be shared. From what we’ve been told, the meeting will probably end at about 8:30 p.m.